I made these last night-- yum! I adapted a recipe from the Dec. 2009 Cooking Light magazine. (NOTE: It's hard to find one without palm oil, but there's an easy homemade recipe in my new book, World Vegan Feast, which I shared on my blog here. Weigh or lightly spoon flour into a dry measuring cup; level with a knife. 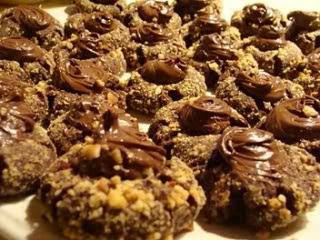 Combine the flour, sugar, cocoa, and salt in a bowl and whisk. Place vegan butter in a large bowl, or the bowl of your stand mixer, and beat at medium speed until light and fluffy (about 2 minutes). Whisk the egg replacer and the espresso powder with 1/4 cup water until frothy and add to the margarine. Add this and the vanilla to the margarine and beat well. Add flour mixture to butter mixture; beat at low speed just until combined, then, if you are using a stand mixer, use the cookie paddle to mix it until it is smooth and shiny. 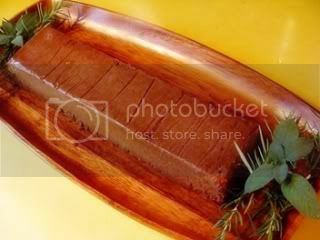 if you don’t have a cookie paddle, turn the dough out onto a sheet of baking parchment and knead the dough 6 times or until smooth and shiny. Shape dough into about 50 (1-inch) balls. Roll sides of balls in the nuts, pressing gently. 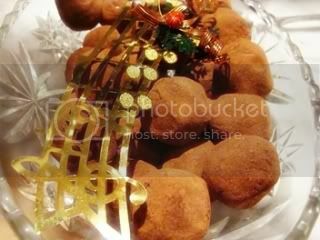 Arrange the cookie balls 1 inch apart on baking sheets lined with baking parchment. Press your thumb gently into center of each cookie, leaving an indentation. Bake, 1 batch at a time, at 350° for 10 minutes. Remove the cookies from the pans and cool completely on wire racks. 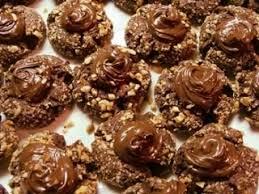 Spoon a scant 1/2 teaspoon of the hazelnut-chocolate spread into center of each cookie, swirling it to a peak. 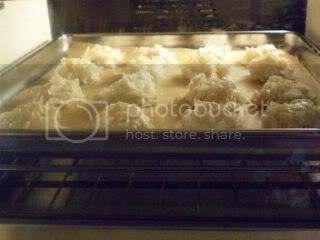 Refrigerate the cookies until the spread hardens and then cover the plates. We don't go to alot of parties, but yesterday we had 2 in one day-- our neighborhood Christmas get-together, and our vegan dinner party group holiday meal. Both are potluck, so I made most of my contributions, or the components to them, on Saturday. 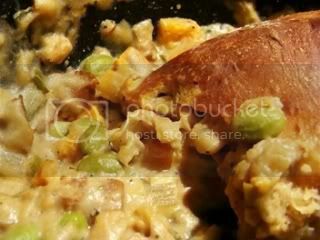 We rushed home to turn on the oven and roll out the fat-free vegan brioche dough (rising in the refrigerator) for my Vegan Chikn Pot Pie, which is full of somewhat unusual veggies and a sherry-laced cream gravy-- I'd made the filling the day before and the gravy that morning. 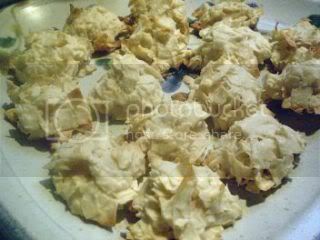 I popped those in the oven along with one of my seitan "hams" (made 2 of them on Thursday) and some pineapple chunks. 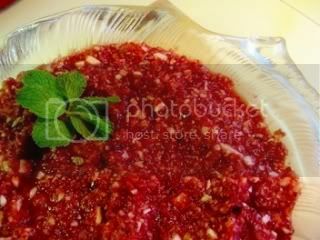 I had made the "ham" gravy that morning, along with a delicious raw cranberry relish. 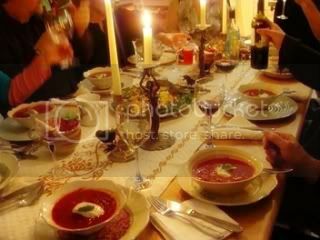 It was great to join with the four other couples in our vegan dinner group for great conversation, wine, and too much wonderful vegan food! 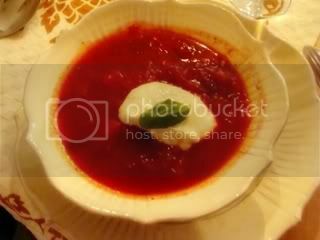 Starting the dinner with Fireweed's absolutely delicious Borscht, made with local (roasted) beets and potatoes! In the center of the table is Sarah's scrumptious Succotash Salad, which I neglected to get a separate photo of, darn it! It was soooo good-- full of lima beans, corn, arugula, zucchini and lots of other stuff. Also un-photographed, I'm afraid, was our hostess's lovely roasted potatoes and glazed, grilled eggplant slices. 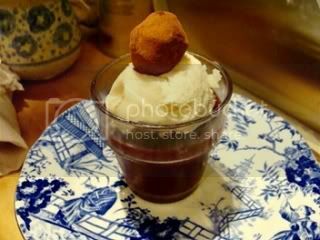 Ellen's refreshing raw berry pudding with vegan ice cream and a truffle on top! 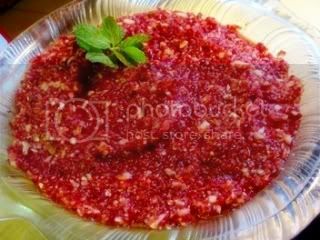 Here's the recipe for the raw cranberry relish I brought. It was given to me by Dori Harvey, a longtime subscriber of my now-defunct newsletter, an enthusiastic vegan cook, many years ago and we loved it! It was a hit at the dinner party, and I ate some for breakfast! Combine well. Allow flavors to meld one hour. Last night we had dinner at our good friends Yoshi and Susan-Marie's house. Our hosts provided the bulk of the meal, our friends David and Carmen brought a lovely green salad, and I brought a bean dish and a simple dessert. The dinner wasn't Japanese, but was served somewhat in the Japanese style, with a number of small vegetable dishes to complement the rice. Yoshi made a delicious rice dish with yuba (beancurd skin) and mushrooms, and Susan-Marie served it with; a sweet and sour tomato soup with potatoes, steamed winter squash, marinated leeks and crostini. Most of the produce she used was grown in their own garden. The leeks tasted almost like marinated artichokes... so good! I brought a dish I blogged about before-- Madhur Jaffrey's Black-Eyed Peas with Corn and Dill from her book "World Vegetarian". 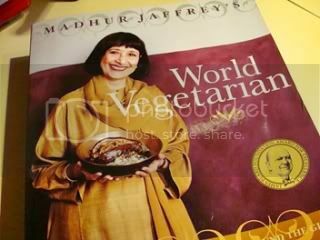 I've been reading (and owning) Ms. Jaffrey's books for years, but "World Vegetarian" is my favorite. It's not confined to Indian cuisine, with over 600 recipes from five continents with endless flavor combinations for beans, vegetables and grains (and dairy, too-- but you can ignore that chapter or use vegan subs). This encyclopedic volume it is arranged so that you can look up the chapter, say, on "Dried Beans, Dried Peas, Lentils and Nuts" and check for, in my case this time, recipes featuring black-eyed peas, and you will find a few recipes utilizing whatever is the particular item you have in mind and in your pantry. You always find a new surprise because you are always looking at it in a different frame of mind from the last time! The recipe I made (on p. 19) is one of my favorites. It's made with items that I always have in my cupboard and freezer (corn, dill, chiles, onions, etc. 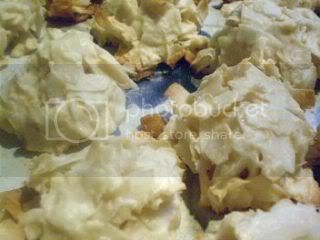 ),and it's full of flavor and texture, but very easy to make. Diners are always surprised by the goodness of this homey but spicy dish. 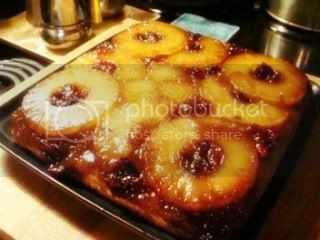 For dessert I brought the pineapple upside-down cake from Tamasin Noyes' recent and very popular book, "American Vegan Kitchen ". 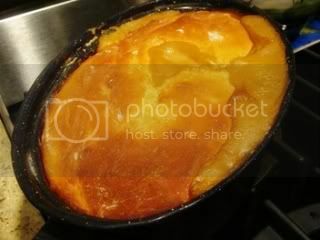 It was easy to make and turned out beautifully-- as you can see from the photo! The only changes I made were to use half wholewheat pastry flour in the batter, and substitute dried cranberries for the cherries in the topping. Our hostess asked me for the recipe because she, though not a vegan, would prefer to make this without the eggs and so much fat as her normal recipe. We ate the whole thing! 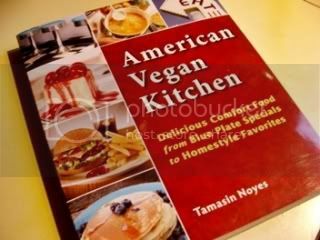 Tamasin's book is well-written, with clear instructions, lots of homemade basics (so you don't have to go buy all your components! 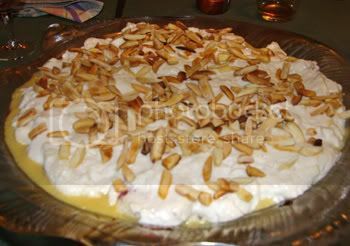 ), and the kind of recipes most us in North America remember with nostalgia! 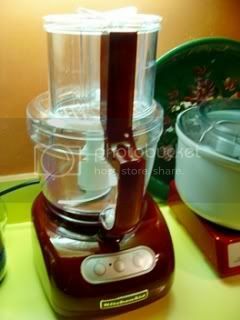 My new Cinnamon Red KitchenAid Wide-Mouth 12-cup food processor! A few months ago my food processor died and I had to decide on a new one. The KitchenAid got rave reviews, but I couldn't afford the 12-cup one (over $300 in Canada! ), so I got the 7-cup one with a small extra bowl for chopping small amounts. It's a great machine, but I missed having more room to do large batches, and my stepson said he'd buy my smaller one. Cook's Illustrated magazine reviewed food processors and gave the 12-cupper a rave review-- even better than the largest Cuisinart! Now they have one with "the largest feed-tube in the business! ", called a "wide mouth"-- you can practically put 1/2 a small cabbage in there! I searched and searched for the best prices, locally and online, debating whether to go for the older 12-cupper, or the new wide-mouth. Price WAS an issue, even though I expect to get alot of years out of it. Well, long story short, I found the wide-mouth (in Cinnamon Red-- not a popular color, I guess!) on eBay, IN CANADA (wonder of wonders), brand-new, in the box, for $179 (which included shipping!). That included all the 3 slicing and shredding discs, an egg whip (have to try it with egg replacer! ), and a citrus press. (You can get this same one in white in the States from amazon.com for $199 in the States; or in Candy Apple red , with 4 discs for $228. But it was $273.75 Cnd. from amazon.ca and $379 in alot of places in Canada!. So, I'm happy, and my stepson is happy! It should get a work-out during the holiday season, and looks very Christmasy, too! Now, Bon Appetit magazine might not be the first place to look for vegan recipes, but I found two in the latest issue while I was perusing it in the car as we waited for the 3 PM ferry. I had no idea what I was going to make for dinner last night, so I was open to ideas. Also, we had gone out to lunch with my mother and a friend, and ate too richly, I'm afraid! So, I wanted something healthful and fairly simple. Soup and a salad sounded perfect. I opened a page, and there was an article about the "perfect" lentil soup, which intrigued me because I love lentils. As I read on (and it sounded good), I was further intrigued by the use of blended, cooked chickpeas to thicken the soup and provide a creamy base. I had to try it! I knew that I had chickpeas in the freezer and everything else I needed. I thought I had French lentils, too, but I found out when I searched the pantry that I had used them up. But I was determined, so I decided to take a chance and use regular green lentils. It was fairly simple and quick to make (the lentils cook in about 30 minutes), even after putting all the grocery shopping away, etc.. 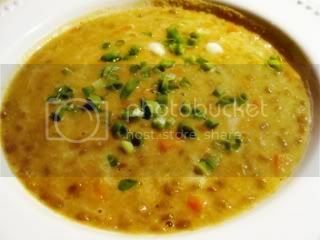 I may not classify it as the "perfect" lentil soup, but it's delicious and creamy and I'll make it again! 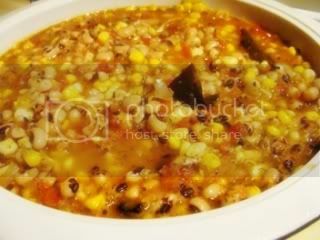 It has also opened up new possibilities for using pureed legumes as a thickener and to add creaminess. Yes, I have used pureed white beans and potatoes instead of cream in soups, but I need to be more adventurous! French green lentils are small, dark green, and speckled with black; they can be found at some supermarkets and at specialty foods stores. Add chickpea puree and butter to lentil soup. 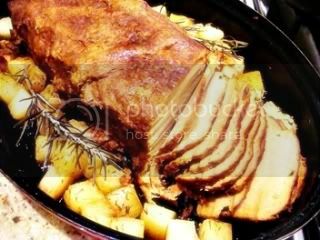 Season to taste with salt, pepper, and additional curry powder, if desired. Add water by 1/4 cupfuls to thin to desired consistency. DO AHEAD Soup can be made up to 1 day ahead. Cool, cover, and refrigerate. Rewarm before continuing. 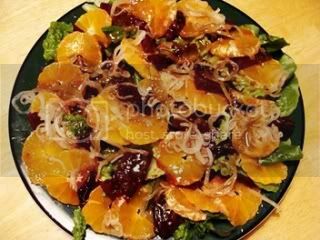 The second recipe I wanted to make was a lovely looking beet and tangerine salad with a cranberry dressing. I didn't have any tangerines, but I had some mandarin oranges that needed using. I had beets. I didn't have watercress, but I could use Romaine lettuce, and I didn't have red onion, so what I ended up doing was soaking thinly-sliced yellow onion in red wine vinegar, to both give it a slight pink color and to get ride of some of the sulfur compounds in the onion. I also had no cranberry juice concentrate for the dressing, but I had my own Raspberry Balsamic Vinaigrette already made in the refrigerator. So, I improvised and it was both beautiful and delicious! 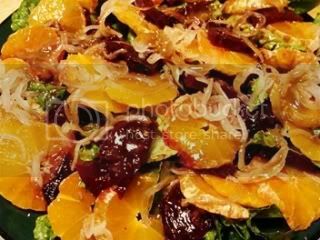 NOTE from BCG: For the dressing, I had no cranberry juice concentrate, so I used 7 tablespoons of homemade Raspberry Balsamic Vinaigrette that I had in the refrigerator, and I added finely-grated mandarin orange zest. The recipe is here.